Real food. What does it really mean? There is no official definition for the term, but there is a general consensus for what it means. 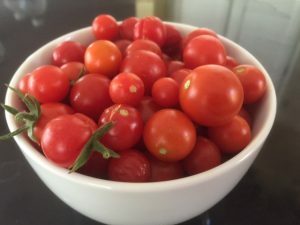 Tasty cherry tomatoes are great when you grow your own and pick as needed. Our bodies require nutrients to function and must be replenished with wholesome food for optimal performance and health. A nourishing meal will leave us feeling satisfied and should contain vitamins, minerals and fiber. Much processed food can certainly keep us alive and free from hunger, but real, wholesome food will also keep our bodies in a healthier state, able to withstand the ravages of disease and exposure to toxins. Pure and Unadulterated, Unchanged by Man. 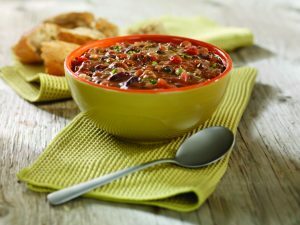 Southwestern three-bean soup with crusty bread. 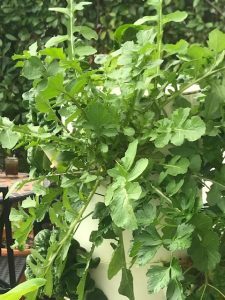 In an ideal world, real food is grown in ideal plant conditions, free from pesticides and other chemicals. Animals are raised without hormones or antibiotics and are free to roam and eat what they were created to eat. Gwen O’Neill has been a gardener for over 40 years and has always been a passionate cook. Her own health challenges led her to experiencing a variety of healing modalities. After finding that her health improved with eating more whole food and improving her nutrition using a real, whole food based supplement called Juice Plus, she committed to sharing this experience with others.